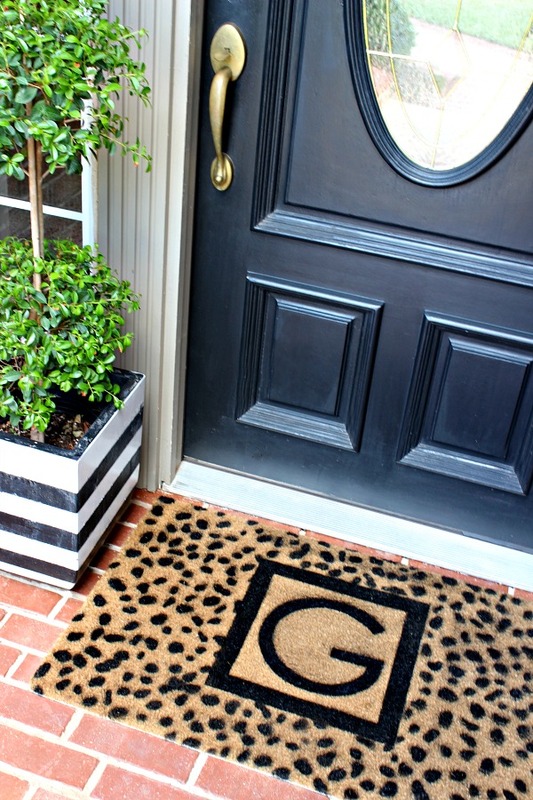 I've been needing to replace some door mats around our exterior doors and thought a quick monogrammed door mat would be a perfect DIY project to add some personality to our front door. 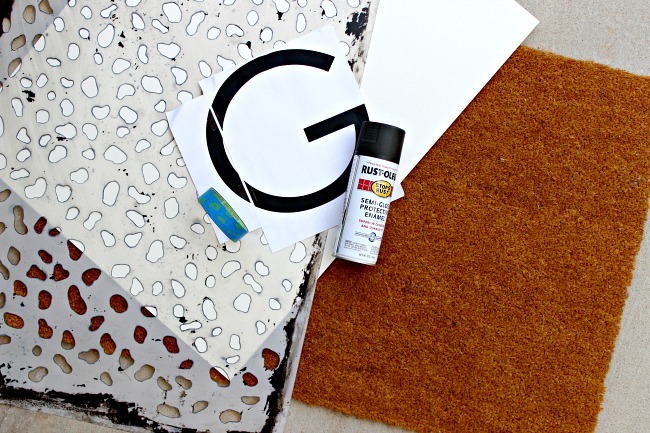 Royal Design Studio Stencils sent me their Cheetah Spots stencil to use in my powder bath makeover earlier this year, but when I shifted gears from my original plan to a new design, I knew that I still had to use my cute stencil some other way! 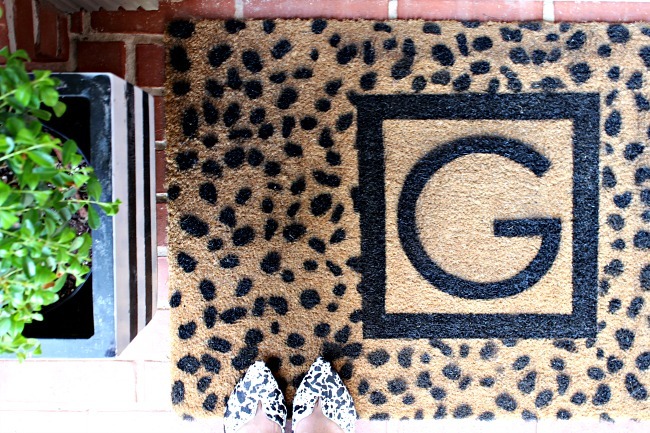 I only needed a few supplies... a plain door mat (this one is 2x3', sturdy and nice quality, and was $10 from Ikea), the Cheetah Spots stencil, a piece of poster board, a letter for the monograms, tape, and spray paint. 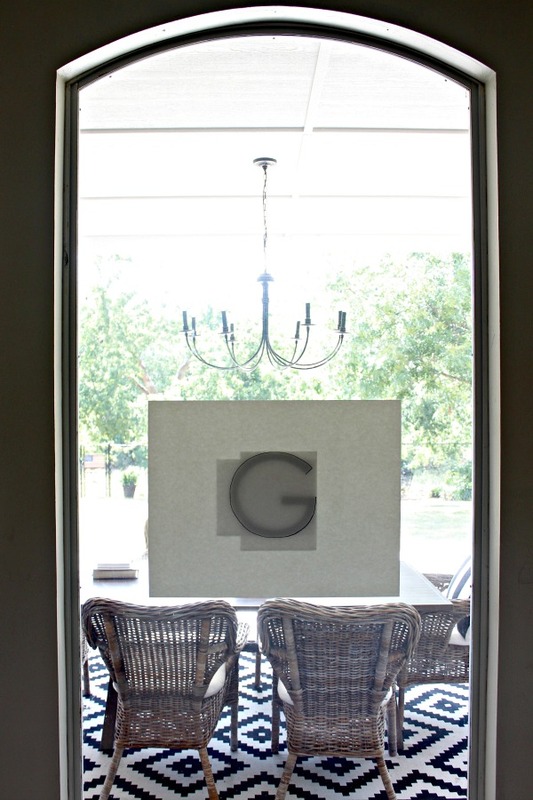 I needed a template for my monogram letter larger than any stencils I already had, so I enlarged it on the copier and used the good ole "hang it on a window" trick to trace it on the center of the poster board. 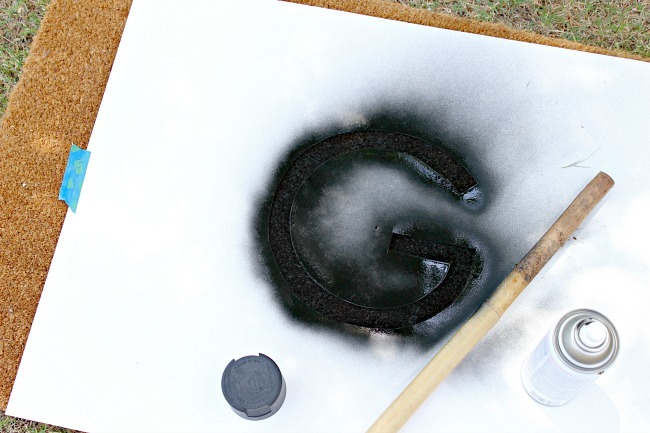 Then I cut out the letter leaving an open "G" in the middle of the poster board. 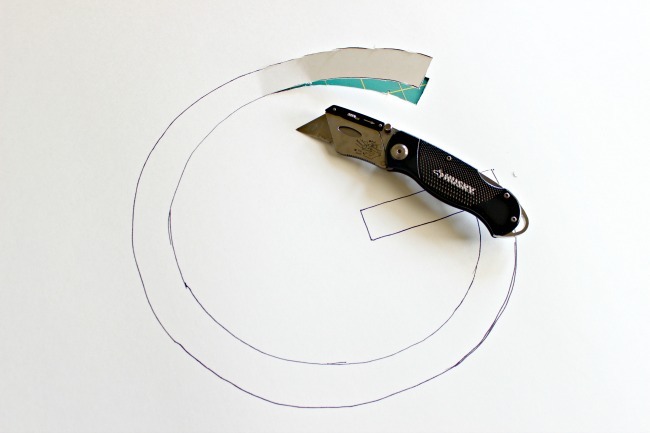 I just got it started with a knife, but it was easier and quicker to cut the rest out with scissors. 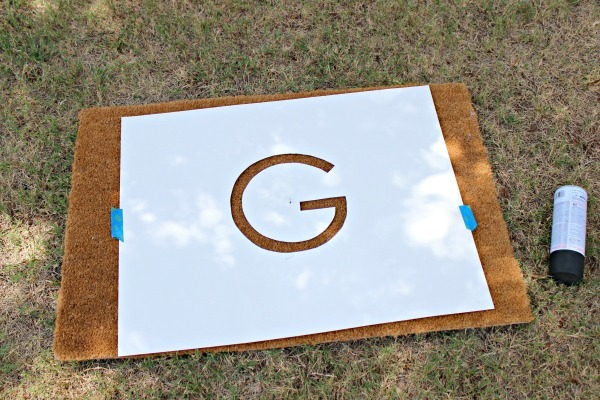 Then, I centered the letter on the mat. There was enough poster board around the letter that I didn't need to worry about overspray getting on the rest of the mat. 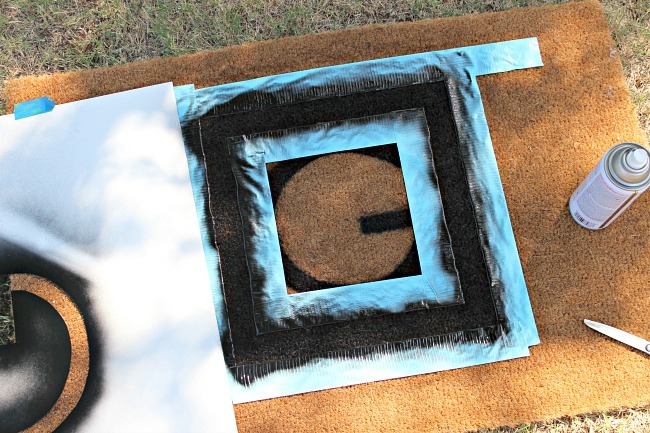 The texture of the mat is really rough, so the painter's tape really didn't help to secure it to the mat. So, I just used something to press the poster board down close to the mat so there weren't gaps around the edges, then sprayed close to the opening, straight down to keep it from spraying up under the edges of the stencil. I wanted a border around my initial, and like I said painters tape wasn't sticky enough, so I used duct tape to mark out a box, just using a yard stick to measure off the open space in between the tape lines. Again, I sprayed straight down. The coverage was pretty good with one coat, but I sprayed a second coat in spots that needed it. I should have protected from overspray a little more in that previous step, because I ended up with a little around my box border. It's ok, though, it's not that noticeable in the the finished product. Now I was ready to add the cute pattern! These stencils are large and it almost covered the entire mat, I just had to shift it a little bit as I went. The beauty of this pattern is that it's so random, you really don't have to worry about matching the repeat up perfectly when you move the stencil. I laid the stencil down on the mat, then covered the box and initial I had just painted with the poster board so it would stay as-is. Then, I just sprayed each dot and worked my way around the mat. 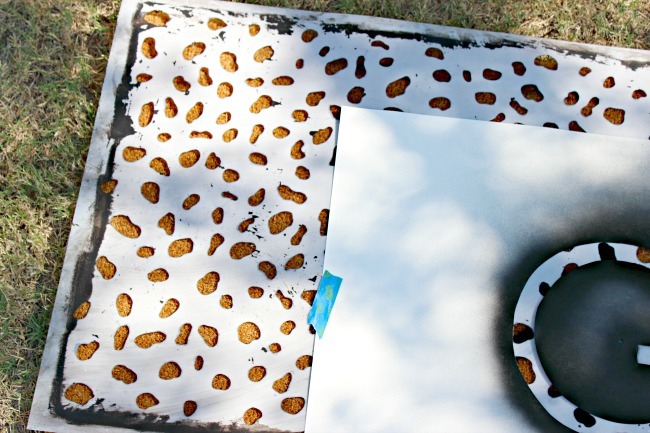 I love how the tan background with the black paint really makes this look like a leopard print! I was done with this project from start to finish in about 30 minutes. I need a trip to Ikea to pick up a few more of these mats... I have 4 more doors that need a new one! These would also make great teacher, hostess, or birthday gifts, or even a nice "welcome" gesture to a new neighbor. Be sure to check out all of the stencil designs at Royal Design Studio Stencils. The selection is vast and beautiful. This is such a good way to achieve the look of wallpaper without the high dollar price tag and installation, too- I'm still completely in love with Kris's stenciled bathroom walls! 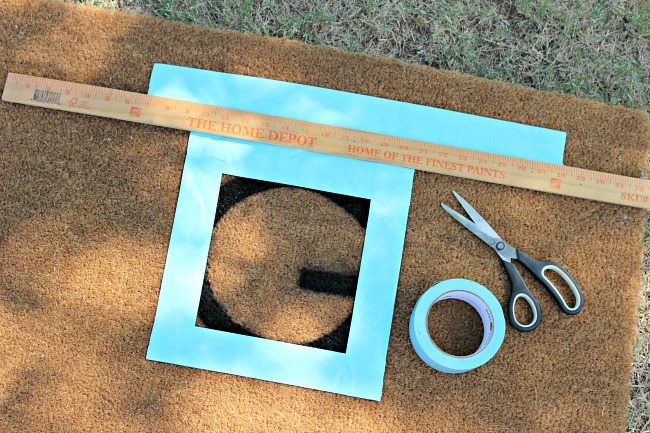 I did a similar door mat project years ago (when the blog was just a few months old!) if you'd like to check that project out, and have lots of other home made gift ideas here. *Royal Design Stencil Studios provided me with product for this project. All project ideas and opinions are mine. Thank you for supporting companies that partner with Dimples and Tangles to keep great content coming! Glad you like this one, Lou Ann! Thanks for reading! 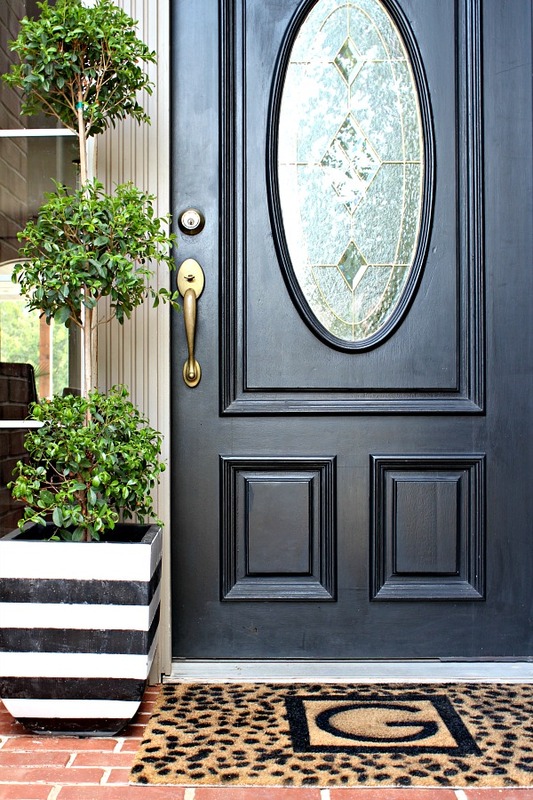 Will the black paint wear off and track inside the home? I love how it turned out though. Good question! No, once it's dry it's on for good. 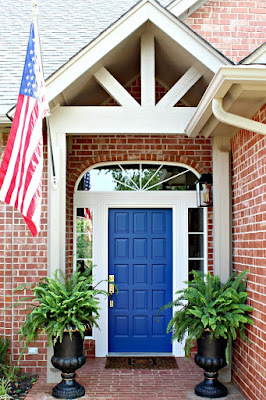 The color may wear and fade a little over time, but the paint won't actually flake off. I love it. It is so you! 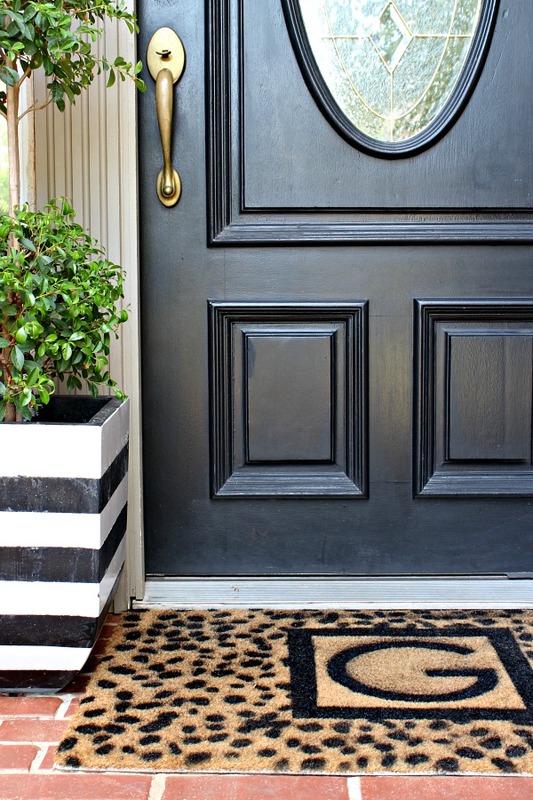 This is what I LOVE about your blog, doable projects with great instructions and TONS of style! Keep up the great work! 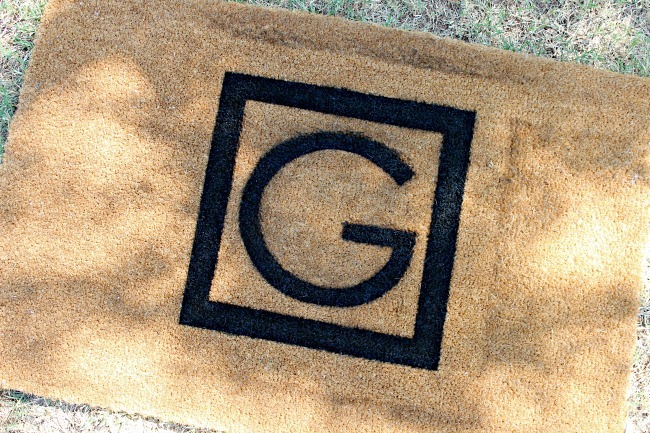 You have done beautiful job with monogram rug. This has turned out unbelievably beautiful. Thank you for tutorial and inspiration. Love it! Thanks for sharing and great instructions. 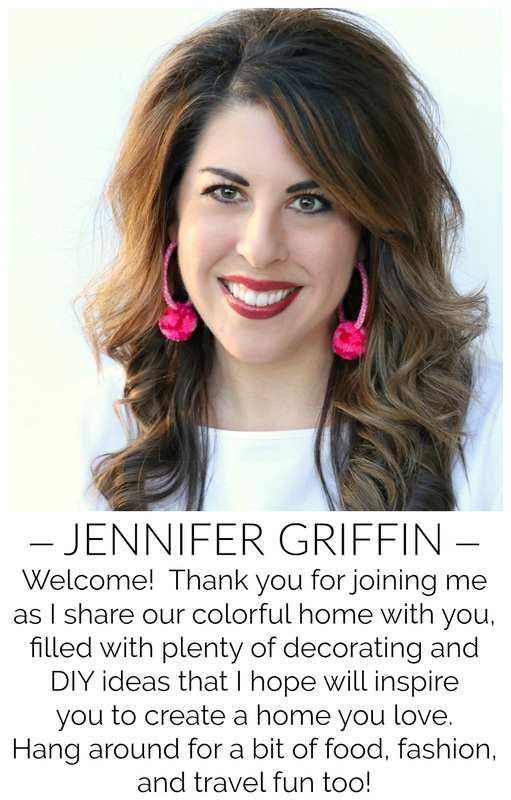 Hey..Jennifer, You did gr8 job. DINING AREAS SWITCH UP... SHOP THE HOUSE!